This week we have a whole slew of changes that are bound to keep the explorer in you happy because we are bringing the Pirate's Lost Treasure event! Travel the world and hunt down the elusive chests. These chests will keep you stocked up all your favorite materials and some extra goodies so keep an eye out. If you’re eyeing a new steed the ‘Ride on Time’ event is starting which will help you in your horse breeding adventures. Next the ‘Get Pirates Rum!’ event will reward those defeating monsters of all kinds. So stock up on those potions and grind away because there will be rum! Stay locked in to the rest of the patch notes because there's something for everyone here! ◈ Pirate's Lost Treasure event will start. 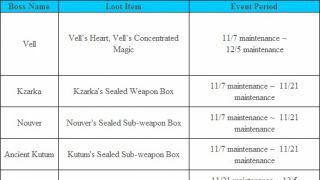 • <Pirate's Lost Item	> Treasure Chests are popping up all over the world of Black Desert Online! Don’t miss this chance to strike gold! • Click < Here > to find out this event in detail! ◈ Get Pirate's Rum! Event will start. 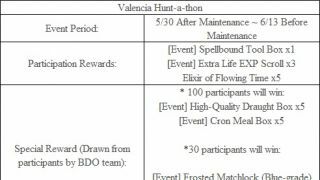 • Defeat monsters in all areas of Black Desert Online to obtain [Event] Pirate's Rum at a chance. • Click < Here > to find out why you need to collect the rum! ◈ Ride On Time event will start. -During the event period, Defeat monsters, Gather, and Fish to get Rainbow Gem Fruit, Spirit Pouch of Ferocious Beast, and Deep Blue Hoof Root. Also, breed your horses and enjoy a boost in getting a higher tier horse! -During the event period, Breed your horses and enjoy a boost in getting a higher tier horse! • Click < Here > to see the times and details of the horse fever time event! ※ The Set Creator from the Pearl Shop will be removed on September 19th. ◈ Please keep in mind that the Set Creator will return with a future event. We apologize for the announcement regarding Node War changes made last week that created some confusion. We want to deliver more precise information and as a result, we would like to share with you the latest information regarding the upcoming changes to the Node War system as below. To participate in a Node War, you will have to accept participation requests in advance. It is similar to the previous “Sign Up,”(now Enlist) but simpler. Once a Node War ends, you can immediately start receiving applications from your Guild Members who want to participate in the next Node War. This means that once Node War is over, the Guild Master or Guild Officer can plan the next Node War. Once their Guild Members are notified and recruitment opens up, Guild Members can start signing up to participate in the Node War in advance. A Guild Master or Guild Officer can press the [Recruit/Closing] button on the bottom of the Guild Member Status tab in the Guild (G) window, to open or close recruitment for Node War participation. 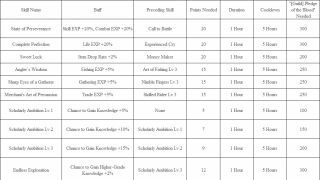 When recruitment is ongoing, a Guild Member can sign up themselves whether or not they would like participate. Participation status can be changed freely until the recruitment is closed, but once recruitment closes your Guild Members can no longer apply to participate. Therefore, when you need to decide your participation status, you should keep in mind what will happen next. You wouldn’t want to end up with not enough members participating, or without your critical force. The Guild Master or Guild Officer can use the “Select Extra Recruit” function to assign specific Guild Members as participants. However, only up to five additional members can be assigned with the “Select Extra Recruit” function. Please be aware that the members you chose cannot be changed once you confirm their selection. It will be the Guild Members who will apply to participate in the Node War. At maximum 5 Select Extra Recruits can be selected and after final confirmation, no other adjustments can be made. Guild Members who have not registered before recruitment is over will not be able to participate in the Node War. To participate in the Node War, the Guild Master or Guild Officer must close recruitment and finish building a fort before 20:00 UTC(EU) / 03:00 UTC (NA). The minimum number of participants for a Node War is 10, including regular participants and additional participants recruited via the “Select Extra Recruit” function. However, the number of participants that actually participate in the war can be less than 10. After the Node War is over, Guild Members who have participated will obtain medals depending on the result of the war. The conditions above also apply to Guild Alliances who wish to participate in a Node War. Node War rules will be changed as follows. 1. From when the Node War ends, the Guild Master or Guild Officer will be able to take in admissions of Guild Members to join the next Node War. ◈ The Guild Master or Guild Officer will be able to take in admissions of Guild Members to join the next Node War using the [Recruit/Closing] button available on the bottom part of Guild Member Status window in Guild (G) window. ◈ Chance to Occupy of the Guild Member Status will change to participation status where Guild Members can apply to participate in the next Node War during the recruiting period. ◈ The Guild Member can choose whether to participate or not freely until the end of the recruiting period. ◈ The end of the recruiting period of guild members to participate in the Node War will be decided by the Guild Master or the Guild Officer. Once recruiting period ends, no more requests to participate can be received from Guild Members. ◈ However, Guild Master and Guild Office can decide on Select Extra Recruit from the confirmation window to join and finalize the Guild Members to fight in the Node War. ◈ At maximum 5 Select Extra Recruits can be selected and after final confirmation, no other adjustments can be made. 2. Depending on the number of participants, the Guild Master or Guild Officer will select which Node to participate in, build a Fort, and gear up for war! ◈ Recruitment period and building of the Fort must be completed before 20:00 UTC(EU) / 03:00 UTC (NA) to be eligible to participate on that day’s Node War. ◈ The final number of the participating Guild of Guild Members + Select Extra Recruit will decide which Node can be selected. Upon building a Fort on a relevant Node, your Guild will be considered to be participating in that Node War. If your Guild withdraws a Fort already built, everything will reset and your Guild will have to start from recruitment again. ◈ The minimum number of participants for a Node War is 10, including regular participants and additional participants recruited via the “Select Extra Recruit” function. 3. From 18:00 UTC ~ 20:00 UTC for EU and 01:00 ~ 03:00 UTC for NA (same as before), Node War will be progressed, and during the Node War, no other participants may join. 4. Once the Node War concludes, rewards will be given out based on the result. ◈ The Guild will receive Guild Funds. 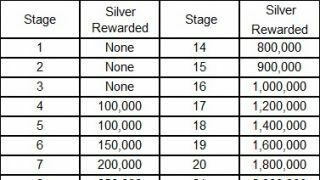 Different amount of money is rewarded per tier of the Nodes. ◈ Guild Members who have participated will obtain medals depending on the result of the war. ◈ Medals will be sent out via in-game mail and it can stay in the mailbox for a period of 1 week only. 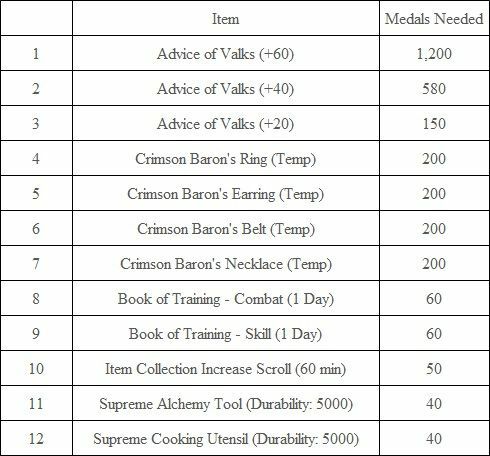 *The list of items you can exchange for medals is expected to grow. ◈ In order to participate in the Conquest War, at least one or more Tier 3 or Tier 4 Nodes must be occupied. 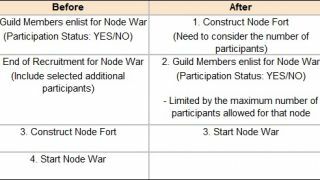 ◈ Node War participation will be finalized only after a Fort is built by 20:00 UTC (EU)/03:00 (NA), after registration to the Node War is confirmed. 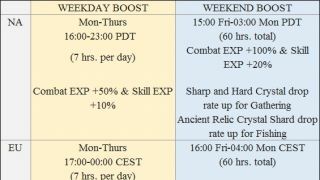 ◈ The same conditions will apply to Guild Alliances as well as Guilds. 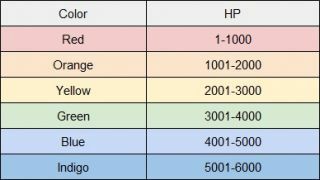 All Nodes will be assigned new Tiers, as follows. 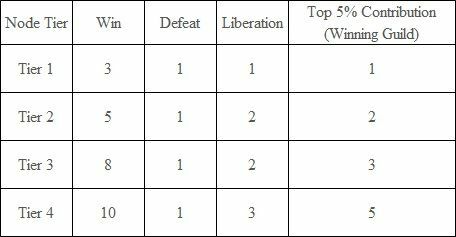 Node War participants will get medals depending on the result of the war, as follows. ◈ War Status under the Guild window (G) will be changed to Conquest/Node Status and on this section, the contribution of the Conquest/Node Wars progressed on that day will be shown. 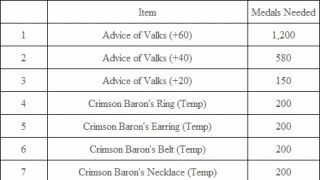 • Contribution will be recorded based on the following actions during a Node/Conquest war. ◈ The Medal is a special reward that is rewarded based on your contribution to the Node War and you can exchange the Medals for various items from a Skill Instructor NPC of each village. • Any abusing/violation of and related to the medals may result in a restriction of your account. ◈ New UI feature for My Information (P), History, has been added. ◈ When you encounter the Phantom Ship in the Great Ocean, you will no longerbe able to press the Ship icon on top left corner in order to auto-board your ship..
◈ A new function that allows you to view the skills that the Fairy can learn has been added. ◈ Default Photo Filter under Display Settings has been changed from Vibrance to NonContrast. • As a result, Recommended 1 photo filter will be NonContrast, and Recommended 2 photo filter will be Vibrance. ◈ The brightness of the lighting effect in certain areas has been readjusted to help with the glaring issue. ◈ The music of the following cut scenes has been changed. ◈ It has been changed so that the Maximize window button will only be clickable when it is activated. ◈ It has been fixed that the character will rise to the surface of the water normally when Breath Gauge runs out in Junaid River. ◈ The terrain of the Terrmian Beach has been changed to look the same as the terrain is displayed on the World Map (M). ◈ Fixed the glittering issue of the rocks inside the cave of the Helms in Remastered Mode. ◈ Fixed the graphic glitch on the puddle of water in Navarn Steppe. ◈ Fixed the issue where the character would fall into the gap among the stone stairs in Mirumok Ruins. ◈ Brightness of the lighting in all areas of Black Desert Online in Remastered Mode has been improved to appear more natural. ◈ The location of the wharf icon for Arehaza Town on the world map now matches the actual location of the wharf. ◈ Fixed the awkwardness in the camera vision when going into attack mode after equipping a Matchlock and mounting a horse. ◈ Fixed the awkwardness in the camera vision when performing the Side Steps skill after equipping a Matchlock and mounting a horse. ◈ Fixed the issue where pressing the ‘S key’ while pressing left and right directional key to change directions while the ship was stationary would move the ship forward. ◈ Fixed the issue where the ship would spin intermittently when changing directions while moving forward with the ‘W key’ and directional keys. ◈ Changing directions while moving backwards will no longer work; the ship will move backwards in the way it did before. 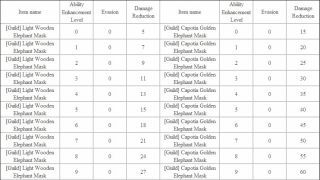 ◈ You can no longer change any equipped item while riding on the back seat of an Guild Elephant. 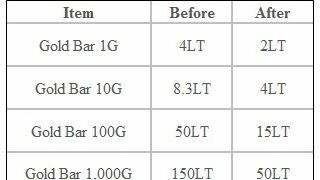 ◈ The motion to recover Stamina during swimming has been improved. • There was an issue discovered where a small amount of Stamina was being consumed during the Stamina recovery motion that the character goes into by pressing T key while swimming. • This issue has been fixed so that there will not be such consumption of Stamina. • Fixed the issue where the character would not follow Navigation when restarting Auto Swim after having recovered Stamina of over 1,000 through the Stamina recovery motion. ◈ Your character will look at you from a more natural height when you first enter the game. 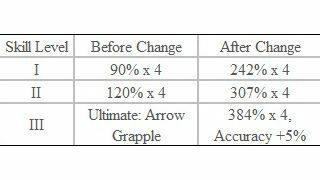 ◈ It has been changed so that Bow Skill I and Bow Skill II will deal damage up to a maximum of six hits. ◈ The skill tooltip of the skill Turn-back Slash III has been edited to be more accurate. ◈ Fixed the issue where the Berserker could walk underwater in Hystria Ruins areas. ◈ Fixed the graphical awkwardness in the right shoulder part upon wearing El Pento outfit in Iron Buster mode. ◈ Fixed the issue where the range of size change of the right hand differed from that of the left hand. ◈ Fixed the graphical issue on the cape of Valoren outfit that occurred while performing certain actions. ◈ Fixed the graphical issue on the neck of the default outfit when body customization was set to the maximum. ◈ Fixed the issue where a part of the hair could not be seen after changing to a certain hairstyle while wearing a Talis Helmet. ◈ Fixed the graphical issue on the chest that occurred when moving in the default outfit. ◈ Fixed the issue where buildings and ships could recover health from health recovery skills when a boss monster was present. ◈ Fixed the issue where the Godr Sphera did not appear right away when the skill Hellfire did not hit the enemy. ◈ Fixed the issue where the colors of the face and neck looked very different. ◈ It has been changed so that the skill Absolute: Stub Arrow could now be used after Backward Chase after having locked Stub Arrow: Triple Shot. ◈ Fixed the graphical issue with the hair that occured while wearing an [Event] Fox Mask. ◈ The skill tooltip of the skill Sah Spree of Sonan has been edited to be more accurate. ◈ The following text has been added to the skill tooltip of Pervasive Darkness. • Inflicts heavy damage by quickly slashing enemies in front and causing stiffness. -	> Inflicts heavy damage by quickly slashing enemies in front and causing stiffness. ◈ Fixed the issue where the orientation of the weapon looked unnatural after going from main weapon combat stance to standby while wearing the Crown Eagle outfit. 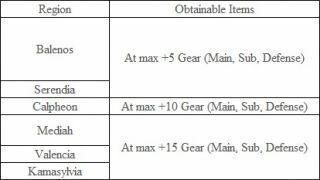 ◈ It has been changed so that upon using the following skills, the Super Armor effect will take effect only during the skill. • While performing combo of Ferocious Assault. 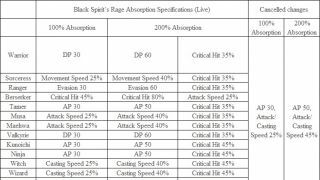 • While performing Ferocious Assault that follows as a combo after using Spiral Cannon. ◈ It has been changed so that falling motion would be displayed upon using Ferocious Assault in Gardbrace mode from above a certain height. 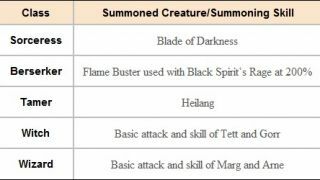 • It has been changed so that the character would not go into a falling motion when using the skill Ferocious Assault at a low height. ◈ The moving distance to the front of the skill Rising Blast Combo has been increased. ◈ Fixed the issue where WP would not be recovered on the 2nd hit of Ultimate Crush II. ◈ The text of ‘3 hits’ has been changed to ’max hits’ on the skill tooltip of Ultimate Crush I~IV. ◈ The text of ‘HP Recovery’ has been changed to ‘HP Recovery upon using skill’ in the skill tooltip of Ferocious Assault. ◈ Fixed the graphical awkwardness in the top of the hands upon wearing Edan's Travel Wear in Gardbrace mode. ◈ Fixed the graphical issue with the shoes that occured while wearing Kzarka Gauntlet. ◈ Fixed the graphical awkwardness in the arm area when wearing Lemoria Armor together with Scale Vambrace. ◈ Fixed the graphical awkwardness in the back part of the hair with the Sanguine Petal Helmet equipped. ◈ It has been changed so that the skill Spring Breeze could now be used via Quick Slot. ◈ It has been changed so that the skill Spring Breeze could now be used in Crimson Glaives mode. ◈ The skill tooltips of the following skills has been fixed to be more accurate. ◈ The skill tooltip of the skill Bleeding Hearts has been fixed to be more accurate. 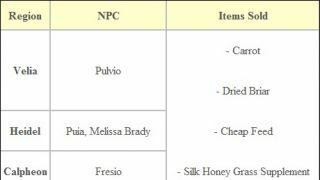 ◈ The Lure Trap items sold by the Material Vendor have been change to Elixir of Gentle Scent. 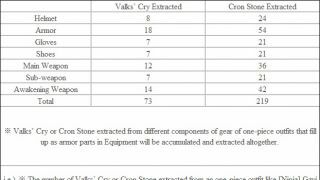 ◈ The crafting method of the following items has been changed from Manufacture to Simple Alchemy. 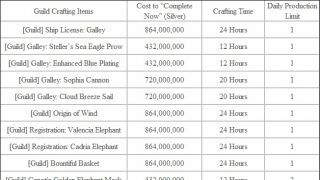 ◈ The text regarding Pearl Items being non-refundable has been changed. 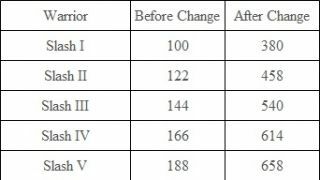 ◈ The following Valencia Guard Captain monsters have decreased in HP by 50%, and AP has increased by 30%. • Upon fighting the Valencia Guard Captain monsters, a warning and Party recommendation system message will now appear. ◈ It has been changed so that the Imps taking fighting motions without weapons against the Guards in Western Guard Camp will now fight with weapons. ◈ It has been changed so that Muskan will start attacking the character after the cut scene of the quest [Co-op] Muskan of Madness. ◈ Fixed the issue where the Dummy of the Offin Tett would not disappear when Offin Tett crawled back into Mirumok Destroyer Offin. ◈ Sound was added for the dragon that Belmorn summons during the quest [Co-op] Defeat the Weakened Belmorn! 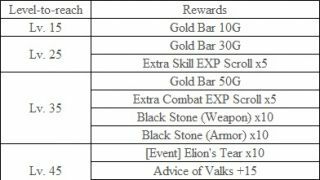 ◈ The reward for completing the quests below has been changed from Lantern to Atanis Firefly. • Why Did the Goblins Run Away? ◈ New Story Quests regarding Aakman and Ancient Civilization of Valencia have been added. • The quest can be completed once per Family. • If you have completed the quest and does not have Knowledge of Ecology of Ancient Ator, you can obtain the relevant Knowledge from Atosa of Valencia. 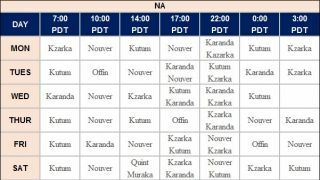 ◈ New hunting quests to hunt <Wild	> Kamasylvia Weasel has been added. • The quest ‘The Poacher's Irresistible Offer’ can be accepted from Jerrimo in Western Valtarra Mountains. • The quest is allowed once per Family, and you can obtain Stuffed Kamasylvia Weasel as a reward for completion. • [Repeat] Carrots in exchange of Fruits and [Repeat] Looking for Weasels can be accepted from Mokassa in Acher Guard Post. • Through the quest, <Wild	> Kamasylvia Weasel can be hunted. • Butcher a <Wild	> Kamasylvia Weasel to obtain Lustrous Hide by chance. • The quest [Repeat] Looking for Weasels can only be accepted when you have Fruit with a Sweet Scent. ◈ The notification icon for friend requests should now appear normally. ◈ Fixed the issue where the popup window for new knowledges and the quest widget overlapped. ◈ Fixed the issue where the Level/Point Information UI was duplicated during the tutorials. ◈ Fixed the issue where the Contribution Point, Energy, and Skill EXP UIs were overlapping for the Custom HP Bar. ◈ It has been changed so that all of Quest Summary will be displayed regardless of the size of the text. ◈ It has been changed so that if there are no more Main Quests to be progressed, the Main Quest widget will not pop up. ◈ The text regarding Occupation Benefit of Calpheon Territory has been improved to highlight certain merits for occupying Calpheon on the Calpheon Territory icon in World Map (M). ◈ A new option to edit Buff List (for all classes) has been added to Edit UI mode. ◈ A new option to purchase Merv’s Pallete from the Dye window (J) by pressing the Merv’s Palette tab has been added. ◈ Fixed the issue where Breeding Count Reset button was being displayed on a Horse under Breeding process. ◈ It has been changed so that the Fairy skills’ descriptions on the Fairy Information window will be displayed normally regardless of the size of the text. ◈ Fixed the issue where cooldown effect on the Fairy Maid would not be displayed properly. ◈ A new color-weak mode has been added to the new HP Bar (after Remastered Mode update). ◈ Fixed the text overlapping issue with ‘Mix&Match’ button located on top right corner of Pearl Shop (F3) with other UIs in certain situations. ◈ The button size of Caphras Enhancement has been increased in size in order to fix the text going out of the box issue from the Enhancement window. 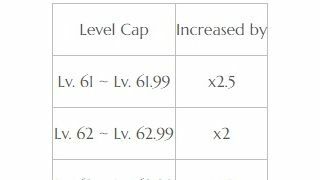 ◈ The Level Up button in Caphras Enhancement has been enlarged. ◈ The Guild Alliance name text limit has been changed to be as long as Guild Name text limit. ◈ Pressing ESC when the window to see the skills that the Fairy can learn will close the window. ◈ Fixed the issue where Breeding Count Reset button was being displayed on a Horse registered in Horse Market. ◈ Fixed the text overlapping issue of Occupation Benefit text in Occupation Information in World Map (M). ◈ It has been changed the Contribution EXP will be displayed on the Remastered Level/Point Information widget. ◈ The Notification Widget (on bottom right corner of the screen) has received the following changes. • Gather!, Assemble!, Summon Party, and Returning buttons have been taken off the Notification Widget and relocated to the button on the left of the Minimap. • Weight and Durability notification will also show up on the left of the Minimap now. • Pearl Shop and Marketplace Notifications have been relocated to be placed below the Notification Widget. • When a new Notification Widget appears in the end, a textbox will pop-up on the bottom right corner to describe what it is. • Notification textbox will close automatically in 1 minute or when ‘X’ is clicked to close it. • When the Notification Widget is folded up, a number will now be shown on the widget to show how many Notifications there are to check. ◈ Fixed the overlapping issue of the hostile adventurer’s HP bar and CC status effect icon from the view of your character. ◈ Fixed the issue where ‘Alliance’ chatting icon was not being displayed. ◈ It has been changed so that the Skill Point icon and Energy icon would not be overlapped regardless of the size of the text on the HP bar. ◈ Fixed the issue where the camera perspective was awkward during Observe Mode in Remastered Mode or Ultra Mode. ◈ Fixed the issue where Atanis Firefly would flicker in certain areas. ◈ Fixed the issue where the Place Mode window of Garden would be displayed abnormally if connecting to client for the first time after Graphic setting was changed. ◈ Fixed the issue where the character would get stuck and couldn’t move around in certain areas of Gorgo Rock Belt. ◈ Fixed the issue where furniture could be seen when opening Dye window in an area with furniture placed. ◈ Fixed the issue where the character would get stuck in Wooden Fence during Conquest Wars. ◈ Fixed the issue where the incorrect number of uncollected rewards was shown in the Achievement Reward window, and in the notification that appears on the lower right-hand side of the game display. ◈ Fixed the issue where the client disconnected abnormally with Windows 7. 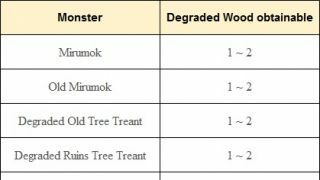 ◈ Mounts can be deliberately inserted in a Conquest War wooden fence. ◈ We are aware of the abnormal lighting effects appeared in Calpheon City, Heidel, and Altinova. ◈ The Interaction button does not appear after purchasing Heidel 7-5 as a residence. ◈ The NPC location does not appear after right-clicking the [Event] Golden Troupe Coin. ◈ The bound effect is intermittently applied right after Lahn’s Soul Raid skill. ◈ Lahn’s grapple skill Soul Raid is not applied normally. ◈ The title “The One Who Saw the Future” appearing on the title list. ◈ The Friend window has to be opened first to get a friend request notification. ◈ The classes appear differently than how they should in the Guild Member Status window. ◈The light beams on the World Map are not visible when the Graphics quality is set to “Low,” or lower.